I’ve spent nearly a week here with Elizabeth (yes, Donn and Susan too!). We saw Donn graduate with his master’s in organizational development. There’s been a lot of family time. Ann and Jack came up from Dallas. Donn and I went to see my cousin, Steven & Betty, and uncle, Truman and Bernice. Of course the big draw was Elizabeth. She was a little slow coming to me, but when Susan gave her a package of string cheese to carry to me so I could open it for her, I was immediately a friend. Soon I was grandpa and the fun began. I am totally proud of Donn. Not only did he do very well in his program, but he is also a super husband and father. I so enjoyed seeing him caring for Elizabeth, jumping to help Susan, hosting a great party with good friends, talking about issues, laughing, living. He and I had great talks about all kinds of things. It was the longest time we’ve spent together in many years. When the end came, we embraced, exchanged “love you,”Â and then embraced again. I had to repent of my stereotyping! Now I have to get back to Doctrine: Timeless Truths for Truthless Times. But I may want to look at more pictures. Or perhaps you want to do it for me? They are here. 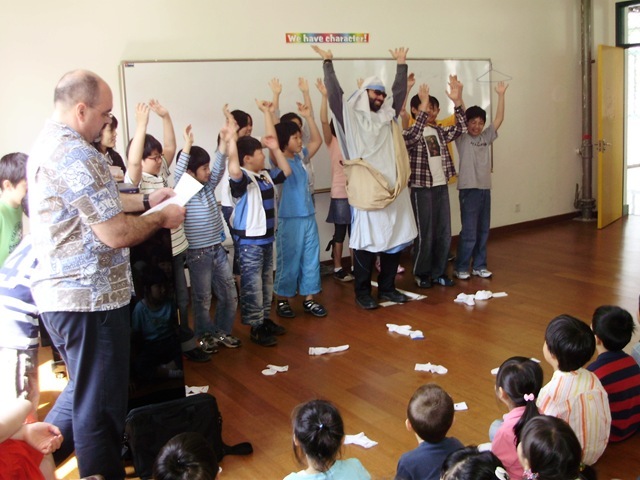 The International School of Wuxi is a for profit international school employing Christian teachers who use Bible for illustrations and have a humanities class each day where the children learn about “The Book.” The rooms look a little like US Sunday School classrooms. It’s all open and above board. The students are from the international business community, most from non-Christian homes, who chose this school because of caring teachers, excellent education and reasonable fees. The outcome is that all students interact with Christianity though no one is pressured to convert. The government doesn’t really care since it is not Chinese students. A key reason for their growing enrollment is that the cafeteria food is outstanding as we found out when they served us lunch. Rick explained his abstaining: he and Andrea were doing a three day fast to seek the LORD’s face as they decided the next step in their relationship. How interesting that here we were staying with Rick at this pivotal moment. After Rick finished teaching, we went to his house to unpack before we walked to supper at a local eatery. I delighted in hearing the old men playing their traditional Chinese instruments in the park as we strolled along the canal. Rick was impressed that I was able to pick up an Erhu while I was in Taiwan and play it easily. 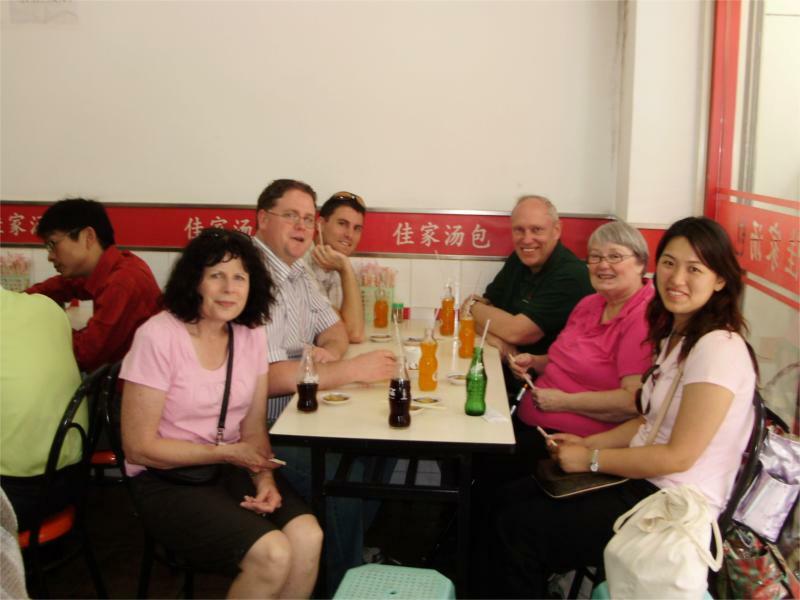 The church in Wuxi is an English language fellowship which is part of the registered or Three Self Church. 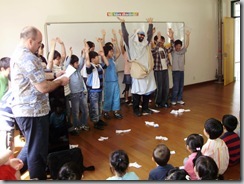 It’s the same as Thanksgiving English Fellowship, whose retreat I spoke at. That means it’s totally legal. Some have great concerns about the government’s involvement in the churches. One odd thing is that one can only use the building during meeting times. Even the pastor can’t go to the building unless it’s a scheduled service. On the other hand, there are supposed to be no religious activities outside the church building. The oversight does add a level of bureaucracy to things, but it certainly doesn’t lessen their zeal for evangelism and ministry. The choir crowded into an apartment for their practice. It was a very international group, all in English and done with great fervor. The neighbors got to hear some good gospel singing. 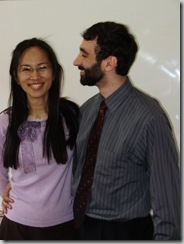 The couple who drove us to the practice only recently came to Christ, she about 18 months ago, he about 10 days ago. Possessing an automobile shows that they quite well to do. Since Rick and Andrea are fasting to make decisions about possible marriage, the conversation turned to what a man must have to be qualified to marry: Job, refrigerator, bed, of course. But at their level having one million RMB (about $150,000) in the bank and paying the woman’s parents one hundred thousand RMB (about $15,000) up front. That doesn’t count the cost of the wedding which can run tens of thousands of dollars for the elegant costumes and an elaborate sit down dinner for many people. We slept on a relatively soft bed, the only time on our whole trip. That combined with air-conditioning gave us really good rest. We got up early to join Rick and Andrea as they broke their fast together with Rick preparing breakfast for Andrea. We talked deeply about decision making and issues around marriage. I surprised Andrea by asking her what strengths she brought to their relationship. She typically thought long and deeply before she answered. It was super to be a part of the process as this godly couple searched carefully for spiritual wisdom. The fourth and fifth grade classes combined to do a drama for the rest of the elementary school. The Pharisees had messed up the people’s dancing. Jesus (Rick) came along to show them how to dance again. It was really fun to see them enjoy doing the play. Then they sat down and Rick connected the dots to the real work of Jesus. While the students went out to recess, I took time to pray with Rick and Andrea. After lunch, Julia escorted us to the train station. I thought she would just drop us off and take the taxi back to the school. How culturally ignorant I can still be!! She not only came to sit with us, but purchased a pass to help us get down to the train. She even talked to the attendant to ask her to watch us so we would not miss our stop. An American part of me felt a bit mommed. I really can do it myself. But the wiser part of me appreciated her helpful spirit and concern for us. Sherry’s knees don’t do well with all the stairs and the need to rush to get to the train. 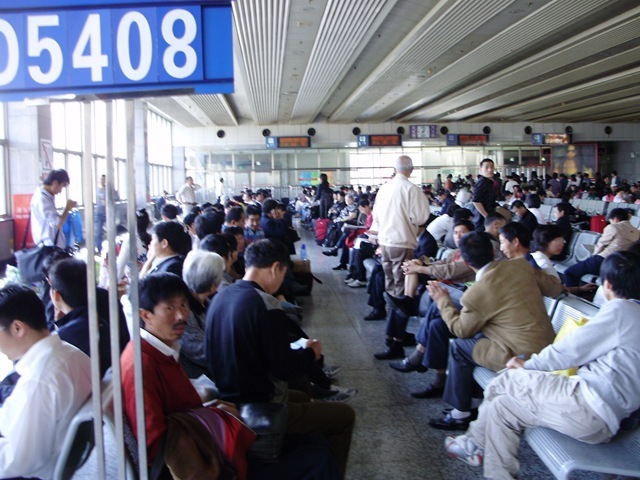 At least when we got to Suzhou we could take our time. It was really good to see Sophia’s smile when we got to the exit. She and Chet, her fellow professor, were able to change our ticket back to Shanghai while we waited in the shade on the nearly 100 degree afternoon. We went to St. John’s Church to meet the lead preaching pastor. He’s only a year out of seminary, but brings a well trained intellect plus a deep passion for reaching people for Jesus. His own conversion story was deeply moving. He was a committed member of the communist party but experiencing a lack. He didn’t know it was a spiritual hunger. He just knew he was looking for something. In the night he had a vision where a glowing man appeared. The man said in Chinese, “I am what you are looking for. My name is gospel” with “gospel” in English. He didn’t know the word at all, but quickly looked it up in a dictionary. It didn’t take him long to connect with Jesus. After a marvelous supper, we went to the other church for the English language Bible study. The fellow teaching was a great guy, but was not able to get down to the beginner level of the students. 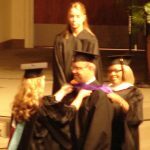 He kept deferring to the professor (me!) but I resisted the temptation to take over! I let Sherry slept in since we’d had to get up early and gone late the previous two days. Then we went to Sophia’s apartment for breakfast and catching up. We hadn’t seen each other in a dozen years when she moved from Portland. 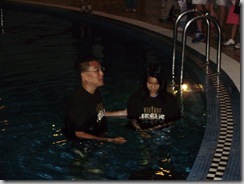 Lots of stories of what God is doing through Sophia and Ernesto in China and in Peru, Ernesto’s home country. 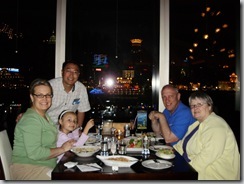 As we talked, we discovered that her daughter and son in law and their three children are members of Grace! I know them casually, but not as Sophia’s daughter. Small world indeed. The afternoon was quite warm as we went to change some RMB for dollars. That can be done only in a few places without losing lots to money change fees. Then we went to the high class part of town to indulge Sherry’s desire to shop for silk. The stroll down the walking street was better for sipping some fresh coconut milk directly from the husk. The silk shop had LOTS of beautiful silk items. I guess that’s shouldn’t be too surprising. The attendant lady was very glad to see two Americans doing socialized shopping, the best way to enjoy. Soon there was a pile of wonders. We started adding up to find the total about 1050 RMB and we had only 900 RMB in cash. No credit cards in China. Sophia said, “Not to worry” and began talking about a “quantity discount.” The lady just tapped the total. “Prices are posted,” she insisted. They took the pile to the manager. He had the same response. Sophia shrugged her shoulders, picked up the cash and headed out the door with me dragging our suitcase behind me. “Just a moment,” the manager called. Soon we were walking out with the precious pile less our 900 RMB. 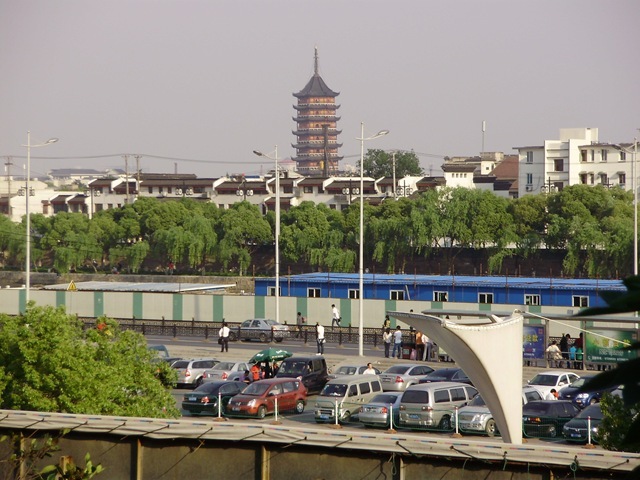 As the taxi took us to the train station, we passed a huge pagoda in the central part of the city. I asked about the religious activity of the Buddhist and traditional Chinese religions that had been ruthlessly repressed in the Cultural Revolution. Pretty secular Sophia said, agreeing with others I’d asked. But there’s a lot of life under the surface. There are lots of monks at the Pagoda. One high tech guy was on a trip with some scientists. They visited a large temple in one of the cities. The highly educated scientists were soon bowing and burning incense. We went into the train station with no idea which of the several directions would get us to our train. So I went to a police officer, showed him my ticket and asked directions in careful English. I know men aren’t supposed to do that, but I do. He queried me in careful Chinese. I said I didn’t speak Chinese, shaking my head sadly. He proceeded to give me directions in careful Chinese. Fortunately he pointed too so I could follow. 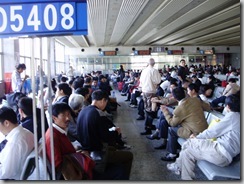 Then I saw the sign with our train number. The train was delayed 25 minutes so we rested and watched the crowd of people before making the quick rush when they finally opened the gate. Up more stairs. I saw the sign that said car 3 was down the stairs to the left. Sherry saw the sign that said track three was to the right. I was surprised that I was pretty crisp with her. Despite heat and stress, there’s no good reason for that. As we got off in Shanghai station Jason called to give me a number to call so John, our dinner host, could tell the taxi driver how to get to their house. It took a while to get through the long line. As we neared the end of the long line, I suggested that Sherry talk with John while I put bags in the trunk. That’s when she let me see she was near tears from all the exertion of the day. I held her for much of the 40 minute journey. Dinner was in one of the ex-pat villas. I was glad to see the inside of the very nice place. On our last day in Shanghai we decided we needed a breakfast “burrito” from the street vendor. When I came to the stand, they recognized me and were very careful to get the preferred ingredients. They tried to converse, asking something. I caught SMIC, the big company that owns the living quarters. But there was no language in common to explain that I didn’t work there. So I stuck my arms out, doing an airplane charade. Who knows what they understood, but there was lots of laughter. The church service started at 8:30. I was a little surprised that the place was less than half full. We sang some songs and then Jason introduced me. I was surprised to see every seat filled and people going back down the stairs because there was no room. That’s common in all the churches in China, I understand. Getting permission for new buildings or extra services in existing buildings is very difficult. But people keep coming to Christ. I simply don’t know how to say good bye to people. I’m a long term relationship guy. Leaving means never seeing most of the folk again. Fortunately there is Facebook and I have some new FB friends. I picked Matthew’s brain as he took us to the airport. He’s highly enough connected that he was with the celebrities in the Bird’s Nest at the Olympics, so I wanted to hear his perspective. He told me that on the whole China’s leaders are neither hostile nor positive toward Christianity, but they are hostile to secrecy. That makes for a difficult tension, but one where pursuing friendships works better than going underground, he thinks. The leaders are looking for things that stabilize the country and typically Christianity does that with its emphasis on family and submission. Things were different 25 years ago, of course, when repression was brutal. But China is changing. A significant number of high leaders are quietly Christian. They don’t want to be embarrassed. In fact he’s more positive on the future of China than on the future of America. He also helped me understand that with 1.3 billion people competing for a place in society, things can be heartless. People aren’t publicly polite as Americans usually are. They won’t respond to a smile on the street. With so many people, you are invisible without a connection, but connections come easy. So something as simple as buying a breakfast burrito gives me a positive connection with the couple, something they’d like to deepen. We could be friends for life. as Chinese. But he turned out to be American. My prejudice, sadly, is still alive! And he sat just ahead of me so I get to know him well. In his restlessness, he often put his hands behind his head, grabbing onto the back of the seat and into my space. Amazing how I resented him taking part of my precious inches. Much of the flight was given to paper grading, which is a little awkward on the airplane tray table, with the coughing man’s seat leaned back. But I persevered and was able to finish as we approached San Francisco. I took time out to watch “Marley and Me” with Sherry. I loved the story of their family. But they were quite successful in getting me to hate Marley, so there were no tears in my eyes when he died. Or perhaps I am the cat lover? Getting home was great. Sleeping in our own bed again is the way it should be. But it’s only for two days. Then we are off to Kansas City for Donn’s graduation. I got an email sharing the very good news that Rick and Andrea engaged. They’ll be married in Portland in July. Jason and I took the subway downtown to meet the pastors from the other international churches. We had some time to look around so we walked the length of Nanjing Road, one of the tourist attractions of the city. Many fancy places to shop, mostly designed to separate foreigners from much of their money! Jason and I ended up in a little shop in the People’s Square, eating a little egg custard pie from a vendor and talking about ministry. 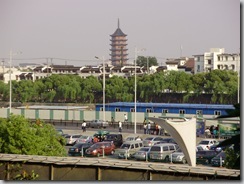 Someone suggested the La Meridian hotel, which is supposedly the #1 hotel in Shanhai. As soon as we walked into the building, I knew this was a different level of place. We sat down in the lobby and soon Nate, one of the pastors and Suzanne and Jeff, two of the associates, greeted us. We went up to the eighth floor to the “inexpensive” Chinese restaurant. Jeff order excellent food for us and we were soon deep into wide ranging discussion. We ended up with Bibles open working through the definition of the church from Acts 2. It felt little like a seminary class! When we were finishing they commented how much they appreciated the stimulation. They don’t get a lot of that in full time ministry. Jason and I went to the urban planning museum to see the plans for the Shanghai Expo 2010 and the soon to be world’s tallest building that is being built along side the current world’s tallest building and former world’s tallest building and a world’s tallest structure (Pearl TV tower) . All this in areas that were mostly farms twenty years ago. Andrea came to our apartment with Angelia soon joining us. We talked in depth of her conversion, how the LORD had used a demon possessed friend of hers to bring her to realization of her need for a true regenerating experience with Jesus. Jesus met her, deeply transforming her. Our interactions were intense and went late. That meant a short night because of our early departure for our trip to Wuxi. Getting to the Shanghai train station is a bit a challenge since it’s way on the other side of town. Subway would mean transferring lines down town. A long walk pulling our suitcase with many chances to get lost wasn’t good. It wouldn’t be good for Sherry’s knees either. Taxi is good, but how do you explain where we need to go with no Chinese? 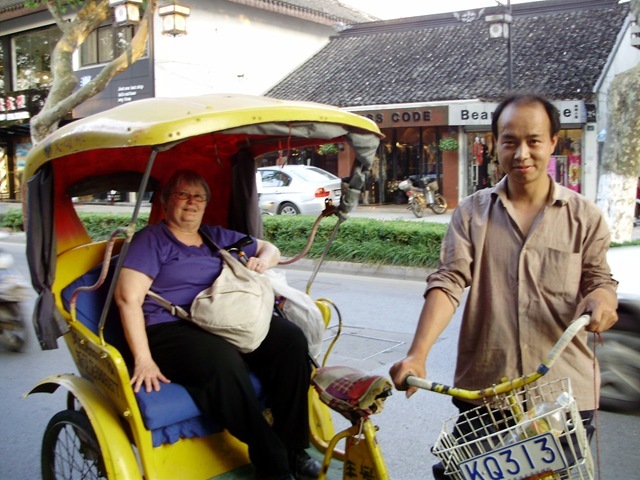 There were possibilities, but the problem was solved with Angelia calling her taxi driver friend. 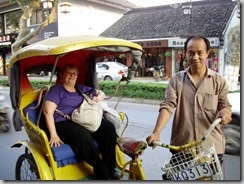 She was there to pick us up at our door at 7 am and drove us through Shanghai traffic expertly. As we came out of the underground parking, we saw a huge reader board on the front of the building. After a moment our train was displayed. After a long walk, we found waiting room 7, 8. But which room should we go to? I went to the information kiosk, showed my ticket to the fellow. He said several sentences of Chinese and pointed to the right. As we waited, Sherry took out her cross stitch. I was surprised how many people came to look at us and what she was doing. The call for the train came in Chinese and English and we joined the crowd going up and down the stairs to the platform to board the train. Stairs are Sherry’s nemesis especially when she’s rushed, so the journey wasn’t a happy one. I didn’t know where car seven was and didn’t want to explore any more than necessary. So I showed my ticket to a fellow behind me. He pointed the opposite way than we were headed. Glad I’m not one of the “I never ask for directions” guys. First class cars on a fast train meant really nice. Lots more room than an airplane. Foot rests, slide out tables, a bottle of water, a movie on the display panel. A lady came through selling “Caffe” but I couldn’t get my wits around me quickly enough to figure out how to communicate with her, so I missed it. We relaxed, watching the scenery whiz by. The display gave the train speed, going up to 209 kilometers per hour which is cooking right along! Another long walk with many stairs to get into the station in Wuxi. As we got to the entrance gate, Julia, Rick’s teaching assistant, was holding her our greeting sign high and smiling big. She surprised me by greeting us with a hug. Not normal for Chinese folk no matter how well they know you. 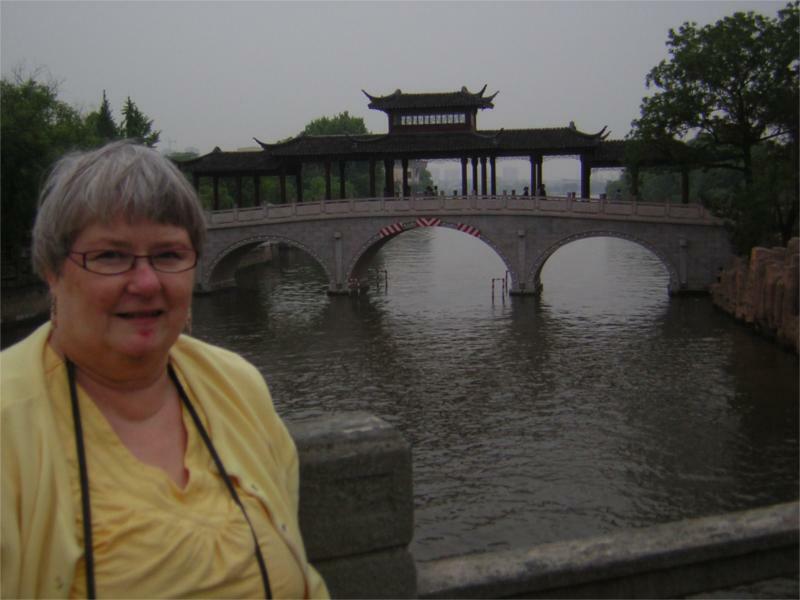 She was buoyant and fun as she took us to a taxi and on to International School of Wuxi. As we pulled up in front of the surprisingly large building, Rick was there greeting us. Monday was our down day . . . well not really. I had the day dedicated to working on Doctrine. Writing on the book is not a happy thought at all. But it has to be. So I applied seat of pants to chair and wrote. When Sherry got up, we talked for a while and then walked up to get some breakfast burritos from the street cart. They were patient with my non-Chinese as I pointed to onions and hot sauce shaking my head and saying, “No.” The “No” didn’t work but head shaking and smiling did. Soon mine was done and I ordered Sherry’s. “Yes” to onions, “No” to cilantro and hot sauce. But the lady half of the team threw the cilantro on anyway, the husband’s words coming too late. I signaled it was OK. But he wasn’t happy. He yelled at her pretty strongly. She didn’t react visibly. I wondered what she was feeling. We enjoyed the burritos as we strolled back to the apartment. Writing came to a blessed break when Jason called for lunch. We went to the laundry service to drop off our dirty clothes. We’d been warned that the lady had no English at all. But she was friendly and we began sign language negotiations. Four loads, she signaled. I took out 40 RMB. She picked up detergent and asked something. As we tried to guess what, Jason walked in and released us from the adventure. As I suspected, she was asking if her detergent was OK. Turns out many people bring their own detergent. They talked about timing. She was busy and the clothes would not be ready until tomorrow. That was when I was really glad Jason was there. I have no idea how we could have made that connection. We went over to where Krista works in the community center to meet her. The taxi dropped us at Johnny Mo’s Diner! Yes, it was a 1950’s style diner with hamburgers, french fries, bottomless drinks, and rock and roll piped in directly from San Francisco! Things like this make it clear we are in the ex-pat part of town. After lunch, I went back to Doctrine. Sherry and Jason went to get their hair washed and their head massaged in the process. After that, Sherry stayed for a foot massage. Thirty minutes of expert work on each foot. Sherry was blissed! She even violated a strong cultural rule and tried to tip the lady. It was refused. Still surprises us both. After working on Doctrine all day, I was glad when Jason came to take us to meet with the TEF leaders at Dan and Crystal’s home. Their buildings were very nice and their hospitality even better. We talked about many things before he suggested that I plug my computer into his flat screen TV. We were off for another teaching time, this one from Vintage Church. We worked through the gospel from Acts 2 and then the definition of church from the same passage. Again, lots of questions as they saw the implication for what they were doing at TEF. As we finished, John asked if I’d like to come speak at their SMIC elementary school English teachers’ Bible study. It sounded like fun, so I agreed. But in the night I woke up with my head working on what would be best to talk about. Weird head. John met me and toured the school. It was fun to see the children happy and excited about school. They were preparing to go outside, not for recess, but for exercise. In typical Chinese way, they all got in straight lines and did unison exercises. I can’t imagine American kids doing that! The teachers gathered in their work room. All were Americans except one from Russia and one from Zambia. Very friendly group. I told them that since they are teachers, I needed to give them a quiz. There was laughter. I asked about it. Turns out that if you make a mistake on a quiz, you have to pay! I gave them a multiple choice quiz on the first thing YHWH ways about Himself. Only one got it right, the fellow from Russia! We had a fun time studying. Sherry and I had our adventure today: The first time out by ourselves. We headed for the front gate to get a taxi. I showed him the piece of paper with the subway station written in Chinese. He nodded as we got in and off we went. We’d been warned: the ride was about 14 RMB. Don’t let them take you for a ride! We’d been there once before and I have some general directions in my head. No problem. Direct route, fair fare. But then we had to find the “House of Flour” to meet Nate. They said the food court is right there and the House of Flour is right next to KFC. The taxi dropped us off at the back side of the complex so we went in by the restrooms. I was pretty sure we were in the right place, but seeing the guy doing his business without bothering to shut the door had me wondering. But in a moment we were in the very large food court and in another moment, we saw the “House of Flour” and Nate. I asked him what it was. A bakery maybe? “Think Death by Chocolate,” he laughed. We boarded the subway and headed for downtown Pudong, the same stop we’d done our other day down there. We bought a milk tea, but with coconut in it rather than the normal tapioca pearls and waited for Nate’s wife of three days, mother, brother and one of his wife’s teachers, a woman from Switzerland. After introductions, we hopped back on the subway and headed to People’s Square. That’s pretty much a tourist thing, so we went north into old Shanghai. Nate knew this wonderful hole in the wall dumpling place. It’s places like this that made Shanghai famous before the government decided to make it a financial and technical center of China. e spurted out, burning my lips and splattering my shirt. 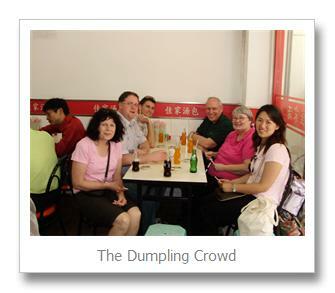 Welcome to the joys of authentic dumplings! Well satisfied, we set off to see Yuyuan gardens, an ancient garden dating back 1559. It’s hard to describe the place: lots of strangely distorted stones, huge koi in the large ponds with very Chinese bridges to take you to pavilions with intricately carved furniture that has to be super uncomfortable inside, surrounded by trees and plants enclosed in walls topped by long dragons. 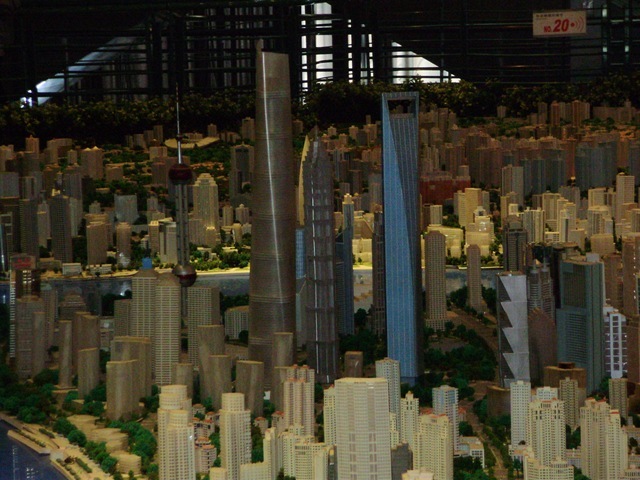 In the background the super towers of Pudong faded into insignificance. We went into a place with paintings by famous artists. The pressure to purchase didn’t let up! I kept saying, “very nice,” and kept walking. A lady was doing one of the painted on the inside bottles. I was really curious how it was done so I stopped to watch. More sales pressure: I’ll put your names inside one,” she smiled. I was ready to do it when Sherry was captivated by a prism type bottle. So suddenly I was in a buy mode. We did some bargaining, with Nate’s help, but I’m sure we paid a lot more than we should have. The painter fellow got more hopeful, but we kept walking. Sitting on the veranda of one of the pavilions in the shade was a wonderful way to get into stories. I asked Nate’s perspective on things in the electronic engineering world of China. He said the US guys were still the leaders by a long way when it came to innovative thinking. It was mere manufacturing and lower level tech stuff that went to China, leaving the US guys free to do the leading edge stuff. I was intrigued that he specifically denied Tom Friedman’s “Flat World” theory. Jason had suggested that we might do dinner together if we got home in time. So tried to call. His phone was powered off. I tried several times, went to their house and buzzed. No luck. So Sherry and I went to a local restaurant that we knew had pictures and English translation on the menu. We were quite successful at picking a couple of good dishes from things like sautÃ©ed eel and turkey tongues in sauce and earth worms (really!!). We couldn’t figure out how to order rice so I got some fried rice pictured in the menu instead. It worked great. As we headed home, the young woman behind the bread cart wanted to sell us a delicacy. I thought that would be a good thing, so I stopped. It turned out she had some English, just enough to make communication almost possible. We got to laughing as she kept apologizing and pretty much repeating anything I said. I picked something and we made the deal happily. Conference day started with breakfast at Jason and Krista. Yesterday Elizabeth, 6, had been the delicate princess, doing ballet to sleeping beauty in her princess dress and veil on her headband. Today she was quite entranced as she sang with Maria in Sound of Music. She had eaten her breakfast already, delighting in the flavored instant oatmeal we had brought for her. Amazing what things one craves when you live in a foreign country. Sherry, Krista and I rode with Eva in her minivan. 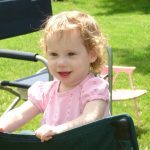 I was in the back with Brandon, Eva’s nine month old in the seat between me and Eva. Brandon didn’t like the arrangement at all and let us know it. Distressed babies touch me deeply of course. Sherry and I both tried to comfort him, but seeing us just reminded him of who he wasn’t seeing! So I hid behind the headrest until he finally went to sleep. We circled Pudong, the east side of Shanghai, headed toward Jiaxing, southwest of Shanghai. We never really got away from endless apartment buildings. 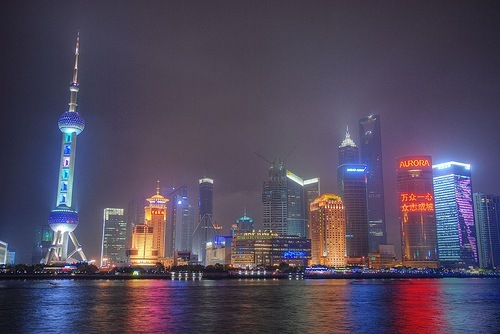 The Shanghai region has some 30 million people and they take up a lot of space, both wide and high. It seems the totem bird of the city is the construction crane. Their wings are spread over buildings and freeways everywhere. The global downturn in Shanghai means only 9% growth this year. But we past pockets of the old China, in decrepit row houses scattered among piles of debris with vegetables growing in well tended patches of ground. I was surprised at the relative lack of traffic on the freeway. They explained that Shanghai tries to limit automobiles by making both the car and the licenses expensive (did I understand $5000 for a license right?? ), and then giving licenses out in a lottery system. That doesn’t stop traffic jams of course. Construction and unpredictable drivers are universal. We saw a bus that had pushed a semi up against the concrete barrier. The passengers from the bus were getting onto another. The passengers in the semi were sitting it out quite unhappily: they were huge pigs. We were ushered into the Parkyard Hotel, a very nice five star hotel in the commercial district of Jiaxing, next door to a very large stadium built for the Olympics. Company logos were on many of the high rise buildings in the area separated by wide streets with beautiful gardened medians. We had our lunch in a private dining room off the main lobby, five of us attended by two very observant servers. Supper was from a very well stocked buffet with tables spread around the balcony of the lobby looking out the multi-storied windows. We celebrated May Day, the fourth of July type celebration in the communist world, in this rather ornate atmosphere. What made it even more ironic is that this fancy place is very near the place where Chinese communism was founded by Mao and his workers. We finally got to our room to find that the temperature was at 27 centigrade, which is way warm for Portlanders. Of course a five star hotel has a rather complicated electronic temperature control. After a few minutes of messing with it (why isn’t there just a dial?? ), I finally got the setting reduced to 20. But I didn’t feel any change. I tried several things. No change. So we slept anyway. I mentioned this only to discover that everyone had the same problem. It turns out that by law the hotel is not yet allowed to turn on their air-conditioning in the rooms. I wondered why the heat still had to be on. So we opened the window instead. I restarted my computer for the morning session and went to do something. When I came back, the screen was still dark. Hmmm?? So I did a hard power down, which I hate to do, and restarted. I got some odd message about windows not starting, would I like to have it attempt repairs. NOT what I wanted to see. Of course I said yes and watched it think. And think. And think. The singing started . . . still thinking. I began to think back up plans. Finally after a restore and a restart, it decided to go. I was GREATLY relieved. I depend so heavily on my computer. If it were to tank, I could still do my thing, but it would be a major hindrance. After the session, I was in a discussion group of men after my morning session when one of the men came and got Jason for something. After a few minutes, Jason came back to fetch me. The general manager of the Parkyard hotels was in the building. Would I greet him? There’s a story behind this. The retreat committee had leased a retreat center from a large company for 600 RMB, about $100 US, per person. But as they saw conference materials, they began asking questions, perhaps under government pressure. Are you doing religious activities? That is not permitted except in religious buildings. If you are religious, you can’t rent our center. With “Vintage Jesus” as the theme, it was hard to say we are doing religious activity! Normally it wouldn’t matter too much, but there is a push back on activities, akin to that before the Olympics, with the International Exposition coming to Shanghai next year. So there was no place for the retreat. Friendships were explored and the Christian owner and Christian general manager of the Parkland allowed us to use their very nice hotel at the same price we would have paid for the much more prosaic retreat center. One night in the hotel would cost as much as the three day, two night retreat â€“ and they threw in all our meals! Tony Azaias greeted us very warmly, shrugging off our expressions of gratitude. I presented him a copy of the book and Jason gave him his own Vintage Jesus T-shirt and name badge. I realized my cultural gaffe when he reached into his jacket pocket to give me his business card. Mine were upstairs in my fanny pack. I received his card with two hands and a bow (I didn’t forget everything! ), apologizing for forgetting card. Later we saw him doing his business in his T-shirt! We gathered the group for our picture. Almost everyone had their Vintage Jesus shirts. It made me laugh. I’m quite sure no one at Crossway thought about this eventuality! Wait till they see the picture. Sherry decided to go see the silk museum while I worked in the room. Unfortunately it was closed, but the taxi driver took them to a very nice park. 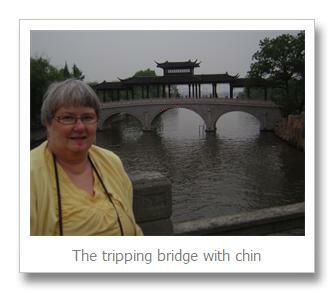 As they were leaving, Sherry saw a picturesque bridge. She got out of the taxi and as she started to take the picture, her foot hit something. No warning, no chance to brace herself. Just face first into the dirt. Stunned, she laid there for a moment. She realized there was pain in her mouth. As she raised her head, blood dripped. The others were there quickly, very concerned. Turned out she’d split the inside of her chin, scraped the outside, bloodied her nose, but no other injuries. Camera and glasses survived. When she walked into the room, she was still shaky. I wanted to help, but there was nothing to do. She was glad to lay down and put a wash cloth filled with ice on it. We were very grateful that there was no damage. She was able to enjoy the sit down Chinese feast. She even stayed for evening session, though not the discussion time after. As I came back up to the room, a group of Chinese people were getting on the elevator, carrying some boxes of stuff. They greeted me and I did the best I could back. They were talking animatedly about something as the door began to close. A boy stopped it and then let it go. The lady was yelling. I wondered what it was. Suddenly I realized she was yelling at me. But I had no idea what she wanted. I felt the moment of total loss. Every meal was a Q & A time. They had many, many questions. The final session was on the spirit world. I wondered what the response would be. The traditional Chinese religions were as powerfully suppressed as the Christians during the cultural revolution. Buddhist temples were destroyed, the priests imprisoned or killed. People had to worship Mao only. But such things die hard. Would the people have remnants? They are English speakers and many are internationals, but not all. As I worked through passages on the other gods and asked questions, I found a lot of interest. The session that was to finish at 11:15 went until almost 11:30 because I couldn’t get them to stop asking. Angelia and Andrea told Sherry later that what I’d explained gave them categories for some strange experiences they’d had. Others told me that for the first time they had tools to deal with stuff. The end of the conference was a baptism of four children. 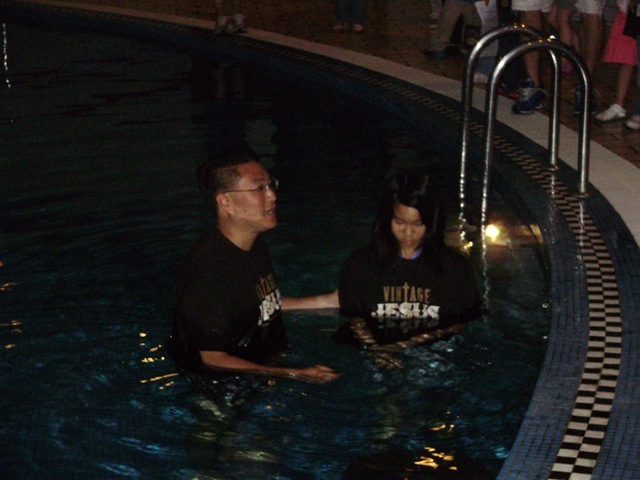 Hearing their testimonies and seeing Jason baptize them in their Vintage Jesus T-shirts was a kick! I felt good though unfinished as we finished the conference. There were so many loose ends. I felt drained from all the talking. This is when it’s clear that I’m not a very good extrovert. So the ride home was long, and longer yet with heavy traffic with so many coming back into the city after the holiday weekend. 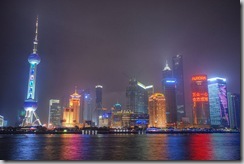 I did enjoy seeing another district of Shanghai. I also felt a little strange leaving internet connection. It’s odd that in a very high tech area of a high tech city I don’t have internet access. We’d thought we could use Jason’s connection. But alas, he’d lost his password for the wireless router. Angelia, Andrea, and Molly came by to fetch Sherry along for some dinner, shopping, and a lot of giggling. They are well experienced and knew where to go and how to bargain. Sherry got some really cute things for the grandgirls and some marvelous shawls. She came home happy and laughing even through it was late. The ladies said they like my wife! I went to the goodbye party for Matt & Rene. They were headed back to the US with mixed feelings after three years here. They’ll not miss being stared at as they walk on the street. But they will miss the close fellowship of the Thanksgiving English Fellowship community. They wondered what their friendships would after three years of apartness and deep changes. It was a little like us when we came back from the Philippines. We never did get the old friendships restarted. Today was tourist day. Jason came by to take me to the street vendor area to buy breakfast burritos. It was a couple behind a cart with a frying surface a little like a Mongolian Grill cooker. They did remarkable teamwork. As he spread the batter, she cracked and egg and threw it onto the surface. As he spread it, she tossed on some greens, he began to loosen it from the cooking surface, folding it a couple of times. As she put some sauce on it, he put a deep fried crispy, completed the folding, hit it with a knife and it was done, all in a minute perhaps. While they do their complex dance, you put your 2.50 RMB (about 35 cents) into the money box, making your own change if necessary. They do this steadily for three or four hours to serve their customers. After breakfast we went to the SMIC (Semiconductor Manufacturing International Corporation) plant to meet with Richard Chang, the founder and CEO. 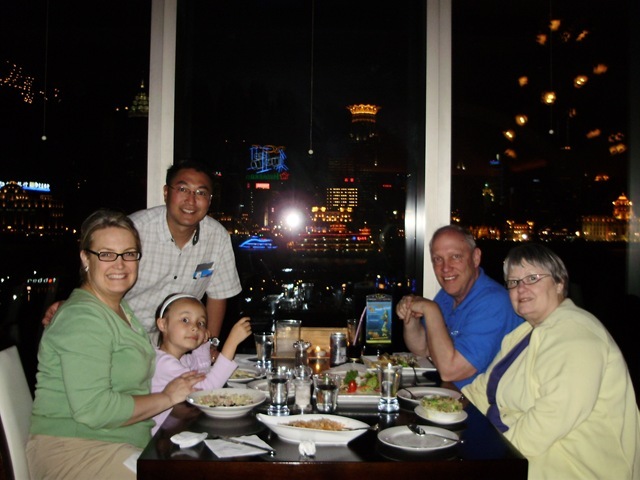 He was with Texas Instruments for a couple of decades and decided to start this company in order to take advantage of an opportunity to do ministry in China. He’s a strong Christian who wants to do good for people, but also to use his company as a chance to promote Christianity. He has built huge modern plants, family friendly housing areas, schools, rec centers, all of top quality with low prices. He hires highly qualified Christians who want to see the Word change people in key roles. Most of the operators for the extremely high tech machines are young women from rural areas who otherwise would be in grinding poverty or prostitution. Part of his building plan is a large Three Self(government approved) church with Evangelical pastors and an English service, which is the group I’m working with. The government is completely aware of what he’s doing, but trust him deeply that he’s doing nothing to harm China. Richard was to meet with me immediately after the quarterly stock holder’s meeting. No stress!! I asked Jason what the protocol was for the meeting. He didn’t know. So I autographed a Vintage Jesus book to give Richard, half expecting we would have a three minute polite introduction time. It turned into almost an hour of Richard telling us stories of how Christianity is pervading some of the highest levels of the Chinese government officials. They can’t be repeated openly, of course. 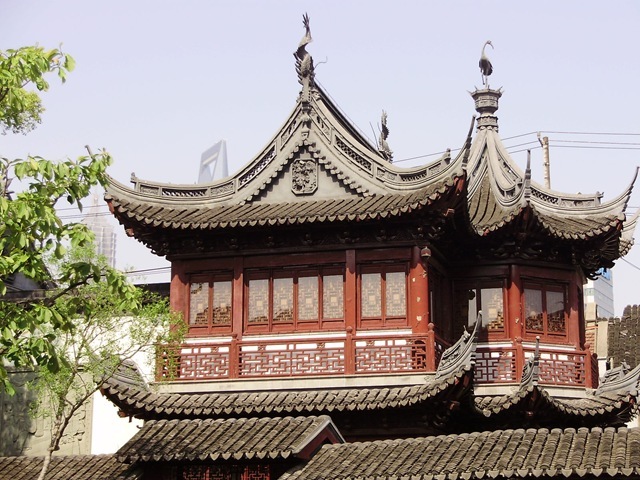 One was a Catholic seminary that was demolished, and the property confiscated, during the cultural revolution. The Christians there politely inquired from time to time about getting it back. No chance. Someone heard about Richard and sent him a letter. He talked to a highly placed Christian who said something to someone. In a while he got another letter. Seems they returned the property, rebuilt the building, installed sewers and such. Now there’s an active fellowship, all provided by the government. Friendship and trust at work. I was still marveling with the stories of Richard as we went to Matthew’s office. He’s the vice president of corporate relations. Turns out he was a very highly placed Washington D.C. attorney who became the China connector, arranging for visits of top politicians to and from China. He knows everyone and has been everywhere! As we got to talking about things, he pointed out that close to 90% of Chinese have a positive view of the American people, but know little about their own country since most don’t travel out of their immediate area. I was fascinated by his vision of what could happen with American – Chinese relationships if there were more open contact. Since we are not staying at a hotel, we had to register at the local police station. Jason told us of a bad experience in the past with a police officer yelling at people. That raised some significant stress in me as a person who just wants to stay legal and avoid all conflict with local authorities. We got there before the translator arrived, but decided to get started. I fidgeted as I listened to two men on the other side of the entry way in a shouting match with two officers. We slid the papers and passports into the lady and she passed back more forms. She had some English and a helpful spirit. In about fifteen minutes, before the translator was able to arrive, all was done and we walked away with the official papers. It’s possible that the presence of a very cute six year old Elizabeth helped! We headed down to the subway to go to Pudong, on the east side of the Huangpu River which bisects the city to see the Shanghai World Financial Center, the building with the notch at the top. Details here. It is the latest entry in the competition for the highest building in the world. Finished about nine months ago, it has the world’s highest roof, highest occupied floor, and the world’s highest public observation deck at 474.2 m (1,556 ft). The records will last until late 2009, when Burj Dubai will break the height record other than highest pubic observation deck. 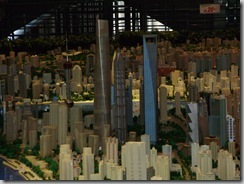 But construction has already begun on Pudong’s higher reply. The amazing thing is that this skyline amazing collection of skyscrapers has all been built in the past decade. If you compare this picture with the one two posts ago you’ll see that in the two year old picture, the Financial Center building isn’t there. The view from the walkway at the top of the notch, looking down onto all Shanghai, was spectacular. So was the Coldstone ice cream. Krista came down to join us for dinner in a very American mall. We ate in an Italian restaurant overlooking the river. The striking things was the background music: Classic rock like Hey Jude, Sounds of Silence. We laughed and watched as the buildings lighted up and dirty cargo ships competed for space on the river with the beautifully decorated dinner yachts. 24 hours of travel from Portland to Pudong will never be anything but long! I had looked at the seat map for our San Francisco to Shanghai leg to discover that the map had changed completely. Our treasured double window/aisle seat at the rear of the 747 wasn’t there. Imagining sitting in an inside seat so Sherry could have her aisle seat for 13 hours brought cold sweat. Walking out to the gate, I scanned curiously to see what aircraft they’d changed to. My heart sang when I saw the 747 sitting there. Sliding into the window seat with room between it and the aircraft wall felt so comforting. Now I could grade my papers and even stretch without worrying about colliding with another human. We went down the Burger King to get some lunch before boarding. Sherry went to hold our table in the crowded eating area and got to talking to a woman sitting at the next table. When I got there, we realized that we knew each other! They’d been students in a class quite a while back. They are Assembly of God missionaries who are so migratory that they have no home. They simply travel the world teaching and consulting. It didn’t sound attractive to either Sherry or me! I often imagine stories about people around me. I dubbed the fellow ahead of Sherry as the “worried man.” The concentration folds above his nose were constant and deep as he considered how to stow his things. Even when they were all satisfactory, the worry lines were still there. I imagined he was one of the coaches for the Chinese athletic team having so much light hearted fun in their bright red and white sweat suits. I imagined they were returning home in happy triumph while their coach was worried about all the other things. The fatigue of worry meant that as soon as possible he pushed his seat all the way back robbing Sherry of the bit of room ahead of her. He seemed to be constantly moving, even when he was asleep. Half way through the flight the attendant was bringing canisters of hot water back to “cook” our Top Ramen style noodle snack. As she came by the worried man, he swung into the aisle, tripping her so she spilled hot water on her leg. She stared incredulously at him, getting no reply. She returned in a bit with more hot water. Apparently she spilled some on him stimulating a very strong reaction. She kindly got him some napkins to sop up the water. Fortunately, that was the end of things and the feud didn’t come our way. Arrival meant the long lines through immigration and then the question of whether we’d have to answer questions about the 40 copies of Vintage Jesus. The open “nothing to declare” line was a relief and soon Jason was greeting us happily and we were on the way to the SMIC complex. We are trying to get used to our nice three bedroom, two bath apartment. It is a little strange padding around in someone else’s apartment trying to find things and figure things out. Some of his stuff is here and there but out of the way, so it’s no problem. But what’s the wooden piece of furniture near the front door? It looks a little dresser drawers, but it’s too skinny. Investigation shows that it’s a place to store shoes. Of course one does not wear shoes in the house. That would be a little like dumping sewage on the floor. The beds are Chinese style, which means that it’s extremely firm, a little like a blanket on the floor. But fatigue helps!